Last year Apple saw the loss of many executives ranging from its OS X chief, iAd chief, and Global Security chief, and 2012 has started off with another leave: the departure Vice President David Tupman. Tupman has been Apple’s Vice President of iPhone and iPod engineering for over a decade, making him a vital component of Apple’s leadership team. Tupman grew up in the United Kingdom and attended Salford University. While there, Tupman earned a degree in the engineering electronics. Tupman put the degree to good use as a lead engineer at Schlumberger, an oilfield services provider, for seven years. Tupman then spent around six years at Psion, working through the ranks until becoming a top manager in the hardware division. By this time, Apple’s engineering prodigy Tony Fadell was working full steam on the iPod, a product that would lead Apple into creating the wildly popular iPhone, iPod touch, and most recently, the iPad. Weeks before the introduction of the first iPod, Apple hired Tupman, and he soon became Apple’s vice president of iPod engineering. He had a big hand in the development and success of every iPod released to date, and when it was time to build the iPhone, Tupman joined the team behind that product, too. As Apple shifted its engineering resources to its mobile line of products, Tupman was named Vice President of iPod and iPhone Engineering— a major role at Apple. Besides playing a major part in growing Apple’s mobile device business into one of the most successful businesses ever, Tupman has his name on at around 70 Apple technology patents, such as power and battery life management, noise-canceling ear buds, Apple’s tiny iPhone power adapters, and mobile device interaction with accessories. According to our sources, Tupman left Apple at the end of last year. This would seem to be a significant blow to the company whose mobile devices helped lead Apple to a $46 billion holiday quarter. Sources also said that a successor is yet to be named, but Apple is actively pursuing a replacement from inside the company…. To confirm, we called his number at Apple and it was deactivated. We asked an operator to confirm that his name had been removed from the directory. It had. We also talked to another source at a hot Valley startup who also confirmed his departure. Tupman reported to Apple’s Senior Vice President of Hardware Bob Mansfield, and his direct colleague vice presidents include Apple’s Vice President of iPad Dan Riccio, and Apple’s Vice President of iPhone and iPod Design Steve Zadesky. Zadesky has engineering degrees from Stanford University and UC Berkeley and he has overseen mechanical engineering for several iterations of the iPod and iPhone, making him a perfect temporary or full replacement for Tupman. In this case, Zadesky would merge the two roles, a similar situation to Tim Cook taking over Steve Jobs’ CEO responsibilities and retaining many of his COO responsibilities, according to sources familiar with the matter. However, Apple’s Director of iPod and iPhone Engineering Vic Alessi may make an even better replacement, as he worked for Tupman directly on iPhone and iPod engineering, sources said. 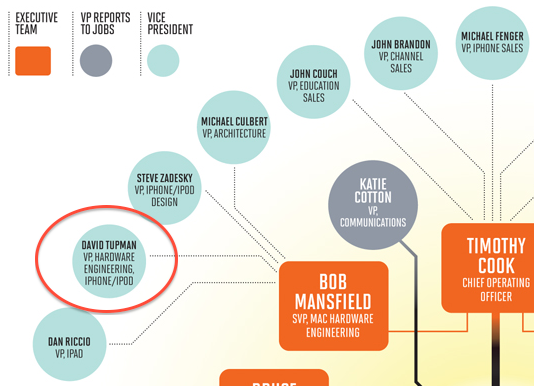 Tupman, being an important mobile device executive, surely has an open spot at any Silicon Valley corporation. Sources could not comment on Tupman’s plans for the future but we have seen some interesting connections being made recently with two of his former colleagues at Nest joining his social networking circles in recent weeks. Nest PR, though, said he is not working for the thermostat company.